How to make Dum Aloo Dhaba Style with step by step recipe - One of the most loved potato sabzi's, Dum Aloo is a palatable potato curry. Although Dum Aloo is a traditional Kashmiri dish, a lot of variations have come up in this recipe. So, today I am sharing my staple recipe of dhaba style Dum Aloo. Therefore, here’s how to make tender and delectable Dum Aloo Recipe Step by Step easily at home. I love dhabha style dishes like chicken curry which I have already shared in my blog, I have tried many dhaba style recipes in my kitchen. 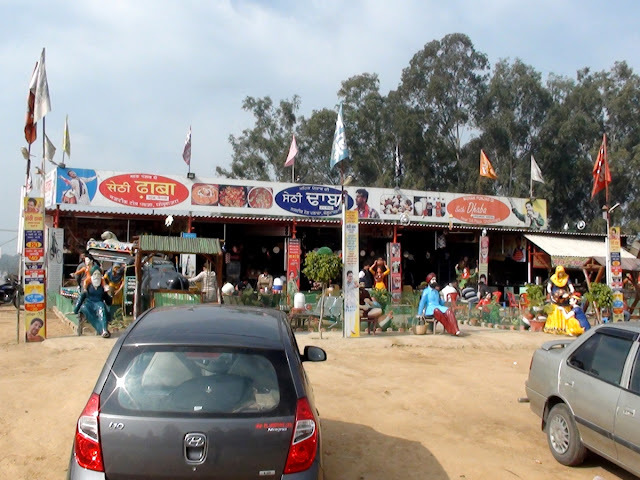 Dhaba pronounced as “Dha-bah” refers to roadside restaurants which are situated on highways and generally serve local cuisine. They are most commonly found next to petrol stations, and most are open 24 hours a day. The word dhaba has come to represent any restaurant that serves Punjabi food, especially the heavily spiced. I am always on a look out for simple yet interesting dinner recipes. And, this Dhaba Style Dum Aloo is perfect to make on the days when I wish to serve a vegetarian meal. Most importantly, Dum Aloo is a mix well and cook fried potatoes with onion tomato based gravy. And, because it has tomato puree, flavors of cumin seeds and fennel seeds, trust me, this side tastes mouthwatering. A few years back, I shared the recipe of Dum Aloo in authentic Punjabi style. Moreover, Dum Aloo is made in different ways like Bengali, Punjabi, Banarasi, Restaurant Style & Nepali as well. Also if you are looking for the thick gravy curry types that you usually get in restaurants, give this one a try. I’m sure you will not be disappointed. 1. Combine the tomatoes and 3 cups of water in a kadai, mix well and cook on a medium flame for 12 to 15 minutes or till they turn soft. Keep aside to cool. 2. Blend in a mixer to a smooth puree. Keep aside. 3. Heat the oil in a kadai, add the cloves, cinnamon and cardamom and saute on a medium flame for a few seconds. 4. Add the prepared onion paste and saute on a medium flame for 1 to 2 minutes. 5. Add the prepared tomato puree, mix well and cook on a medium flame for 2 to 3 minutes, while stirring continuously. 6. Add the salt, sugar and fresh cream, mix well and cook on a medium flame for another 1 to 2 minutes. 7. Add the coriander and cook on a medium flame for 1 more minute. 8. Add the fried potatoes and cook on a medium flame for 1 to 2 minutes. 9. Garnish with coriander and serve hot with naan or parathas. You can try more easy potato recipes from my blog..
h Happy Cooking & Enjoy !! Dhaba style dum aloo recipe looks yummy. Potatoes are always a saviour when in doubt. Love dhaba food especially while on road trips . This dum aloo looks so inviting.. beautiful color too ! I always prefer dhaba food to hi end resturants as they have a hearty feel to the food and so much depth of flavours are there which is lacking in any high end restaurants your version of dhaba style dum Aloo is bang on in flavours and look would love to enjoy it with some hot Tandoori rotis. Love this version of dhaba dum aloo, it tastes so good. Lovely share. wow this dhaba style alu dum looks crazy. I love the vravy and color it shows. Jolly please pass me this bowl will finish it with rice. I love dhaba food but in pune it is hard to find. Always in for aloo, and dhaba style in one of my favorite. Let me make some tandoori naan now. I Also visited sethi dhaba on the way of ambala and Chandigarh route, and your dum aloo recipe looks so fantastic and tasty too. I love the dum aloo. Looks so yummy . 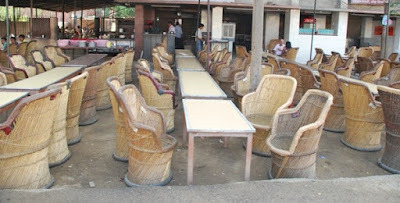 If you are to eat authentic food , go to a dhaba. They serve a teal authentic food without any frills. These dum aloo look so good with a lovely color of the gravy. Dhaba food is always superbly delicious. And this dum aloo looks mouthwatering. I am drooling. Loved the pictures. You can call it gorgeous dum aloo. Superb share. Dum aloo is such an awesome dish, dhaba style surely is a double delight for aloo lovers. This looks so beautiful and lip smacking. Lovely share Jolly.